Crusader States are on a hostile frontier and exist in an almost constant state of war. 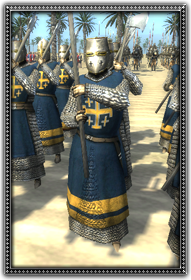 Because of this, Crusader States need full time troops, that do not need to be hired or levied, such as the Edessan Guard. Hardy troops armed with vicious two-hand axes.